High Speed Double Twist Bunchers &High Speed Bunchers. Take up bobbin size:φ300mm,total width:210, the inner hole size is up to customer’s bobbin. Stranding suitable for stranding more than 7 pieces of copper wire, tinned or silvered wire, and vanished wire. Travers: we use φ15 polish rod traverse unit to traverse, the traverse extent and distance are adjustable. Motor of the stranded main machine: 4KW Siemens motor and 4KW American Emerson convertor. Brake: electromagnetic brake, automatic stops when wire broken in or out the machine or set meter is full. Lifting: Taiwan imported hydraulic machine. Japan imported NSK main drive bearing. Protection: Automatic stop when wire broken or reached at set meter length. Safety protection: if the lifting is not ready, non of the doors can be opened could start. High rotating speed, good stability. Latest wire put through system be used. The lead wire be connected to the bow from guide wheel of the main axis directly, which avoid the scratch or wire slipping may caused by the malfunction of the aluminum wheel corner. Lubrication of the main axis: thin oil. Natural circling cooling to lengthen the life of the machine. 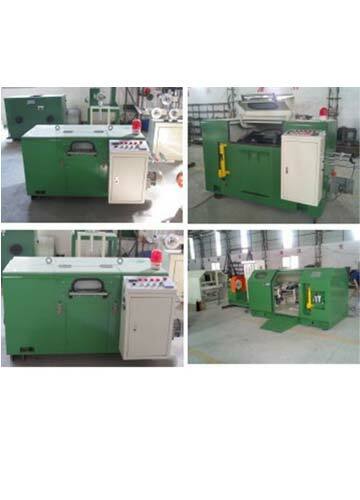 Plenty safety protection, if each start door contactor are not ready, the machine could not be start or automatic brake. The main axis and the aluminum wheel been treated with high speed dynamic balance, which makes the noise under 80 decibel. Advanced control method been adopted: working program controlled by program controller and transducer. Relative indicator lights monitor the working position of every door could be opened and closed, wire broken, oil degree of the main axis. Japan imported high speed spring steel. Tools: one tool box, one pair of grease gun, one pair of scissors, one suit of inner hexagon spanner, one piece of grease. One suit gear, four shock-proof rubber mats, one piece of flat belt.